Franklin Graham, son of late famed evangelist Billy Graham, is stopping in Canby, Oregon this August. It has been 26 years since the late famed evangelist Billy Graham came to the Portland area. But now his son Franklin Graham will pay a visit with a stop in Canby this August. 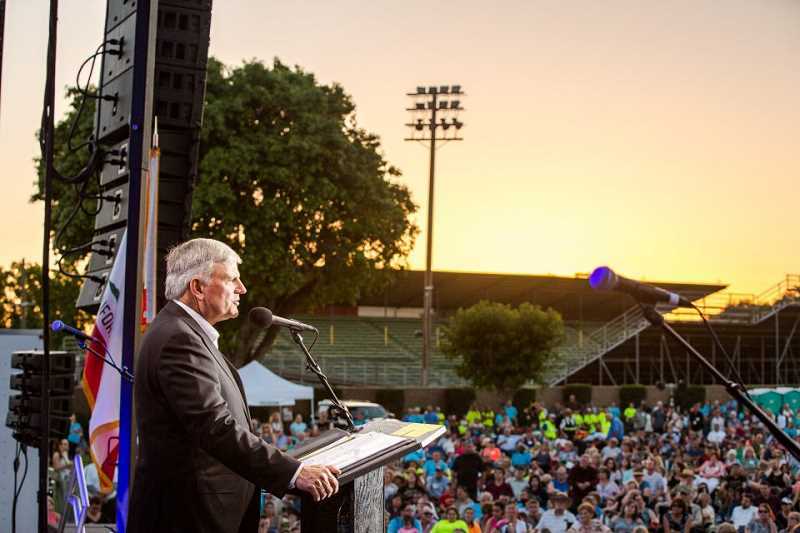 During the month of August, Franklin Graham is holding a series of one-day prayer and evangelism events across Washington and Oregon for his Decision America Pacific Northwest Tour. He stops at the Clackamas County Fairgrounds on Aug. 5 at 7:30 p.m. where he will share a message of hope, and audiences will enjoy music from The Afters and more. There will be no seating provided, so attendees are asked to bring blankets and chairs. Billy Graham has preached the Christian message to nearly 215 million people in live audiences around the world under the banner of the Billy Graham Evangelistic Association. Following in his father's footsteps, Franklin Graham has preached more than 180 evangelistic festivals in 37 states and 47 countries since 1989. But Franklin Graham has never been to Portland, until now. So mark your calendars.